The price of Honeycrisp apples is at an all-time high, and it’s really making a lot of people upset. But Honeycrisp lovers are still buying Honeycrisps as they reconcile their anger with the apple’s perfect texture and flavor. 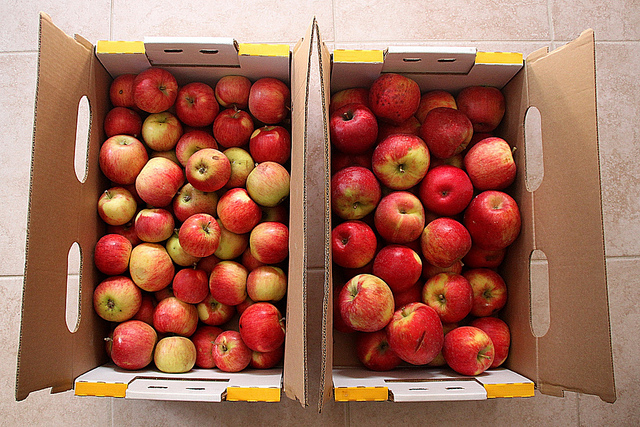 Most other apples—the Galas, Romes, Granny Smiths and Red Deliciouses—cost just over $1 per pound. But the price of Honeycrisps have skyrocketed to about $4.50 per pound, according to Esquire’s Elizabeth Gunnison Dunn. Dunn, the granddaughter, niece and cousin of New York State apple growers, said that at this new price, Honeycrisps may be the first “designer,” name-brand apple to price out the market in 400 years of apple growing. So, just why are the crispy, delicious fruits so darn expensive right now? Dunn said that the price of the apple can be partially attributed to its success. It has officially out-appled all of the other apples on the market. David Bedford, the man responsible for creating the Honeycrisp apple 20 years ago, told Esquire he has never seen this price phenomenon with any other apple. “There are varieties that have garnered a 10 percent premium to standard pricing, and usually they have a promotional campaign behind them. Honeycrisps don’t just become crispy and crunchy and juicy all by themselves. Sure, farming practices help you get better apples, but Honeycrisps are Honeycrisps because of their unique genetic variation. Science is behind that deliciousness, and people are obsessed with that science. My mom mailed me Linvilla Honeycrisp apples. if that's not love, I don't know want is. just spent $17 on honeycrisp apples. What is my life coming too? I'm a broke college student?? That devotion and obsessive love for Honeycrisp apples is what’s driving prices up so high, according to Bedford. More people have discovered Honeycrisps in the last few years, but supply hasn’t changed. Farmers are struggling to keep up with the demand for Honeycrisps, which cost them more to grow because they require extra care and maintenance. And growing apples isn’t a quick, yearly process like you might think. Bedford told Esquire that it can take up to five or six years from the time a tree is planted for it to produce commercial quantities of fruit. So now that we know it’s our love for Honeycrisps that making them so expensive, where is all the money going? According to Esquire, most of the extra money you’re paying for Honeycrisps goes directly back to the farmer. The wholesale price of the apples (from the farmers to the store) is so high that the stores can’t charge much more than the wholesale price. Retailers actually make smaller profits off of Honeycrisps than they do any other apple. Next time you bite into the perfect flavor and crunchy texture of a Honeycrisp while you walk away $15 poorer, you can at least be comforted by the fact that your money is going right back to the hardworking apple farmers. It’s a high price to pay, but at least it’s a delicious one. How To Make Delicious Stove Top Pizza – No Oven Required!